We got the chance of trying out our new DPAC banner today at the Budget Day protest rally from Trafalgar Sq to Downing St organised by Right to Work and Coalition of Resistance. This is supported by Stop the War, Labour Representation Committee, CND & DPAC. When we arrived at Trafalgar Sq there was already a good number of people with banners and placards. 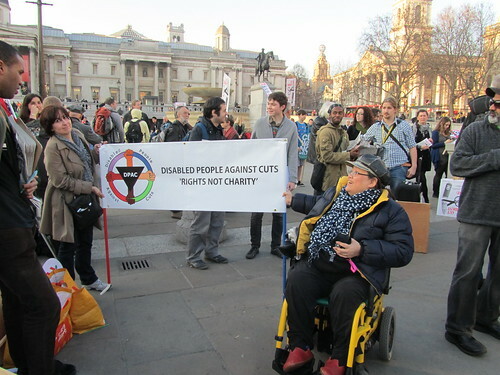 Some of our fellow activists from the Atos demo were also there. At just a little after 5, we set off – it gave us a fore taste of what it might be like in 3 days time but obviously it was a short route and there were not that many of us. It made me realise that I cannot hold up a banner, drive a wheelchair and tweet at the same time! We were told that the Tories hid from the protestors that morning and did not turn up – they cancelled. What does that say to us? We heard a few speeches, I gave mine – we all took photos and networked and went our separate ways fired up for the big day on Saturday. Photos are at DPAC Flickr.